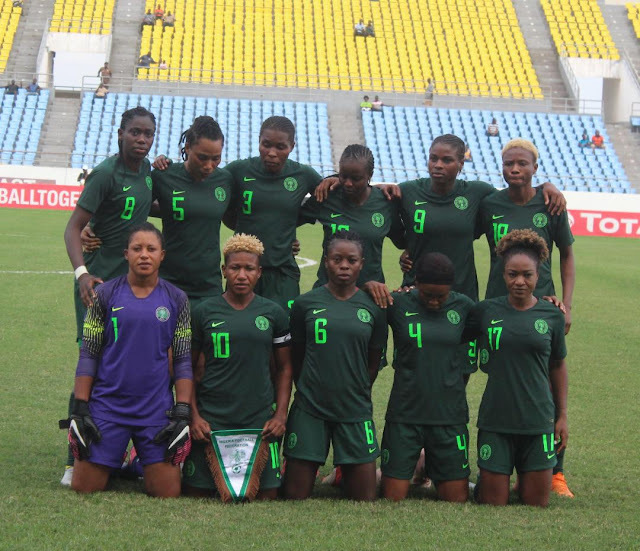 Cup holders Nigeria have expressed confidence of reaching the Final of the 11th Women Africa Cup of Nations, ahead of Tuesday’s semi final clash with the Lionesses of Cameroon at the Accra Sports Stadium. A 4-0 win over Zambia in Cape Coast on Wednesday zoomed the Falcons back into contention following an opening-day 0-1 loss to the Banyana Banyana of South Africa, and the 6-0 mauling of Equatorial Guinea on Saturday sent the Nigerians into another semi final stage – a stage they have never failed to reach at the Women Africa Cup of Nations. On Tuesday, the eight –time winners come up against the Lionesses of Cameroon, their victims in the Final of the last edition of the tournament. A capacity Stade Omnisports Ahmadu Ahidjo in Yaounde watched in sheer agony as Desire Oparanozie scored a late goal to give Nigeria victory and the trophy two years ago. “We are in great spirit for the semi final match with the Cameroonians,” team captain Onome Ebi told thenff.com. “We made our mistake against South Africa, and I think it was a great wake-up call for us. That defeat told us something: that we should never under-rate any team and that we must be ready to give our 100 per cent for every match. Oparanozie, whose goal saw the host team sucking at their thumbs two years ago, has netted twice in this tournament, same as all –action winger Francisca Ordega, with Asisat Oshoala boasting a hat-trick against Equatorial Guinea, and other goals by Rasheedat Ajibade, Rita Chikwelu and Amarachi Okoronkwo. The winner on Tuesday earns an automatic ticket to next year’s FIFA Women’s World Cup finals in France, with the loser having another opportunity as the third placed team will also get a ticket. The loser takes on the loser of the second semi final between South Africa and Mali (also on Tuesday evening, in Cape Coast) to determine who bags the third ticket to France. The Lionesses bagged seven points from three matches to top Group A, beating Mali and Algeria and drawing with hosts Ghana in a match that saw the host team eliminated. Nigeria finished second in Group B with six points behind seven –pointer South Africa. Tuesday’s match starts at 3.30pm Ghana time (4.30pm Nigeria time).